For those Texans who bleed Lone Stars, (or those who wish they were Texans), this handmade sterling silver seven band and charm ring tells admirers just who you are: A Texan SEVEN DAYS A WEEK! Handmade dainty rings are gently hammered for added shimmer and stacked. They are then gathered by a handmade sterling silver wrap band. 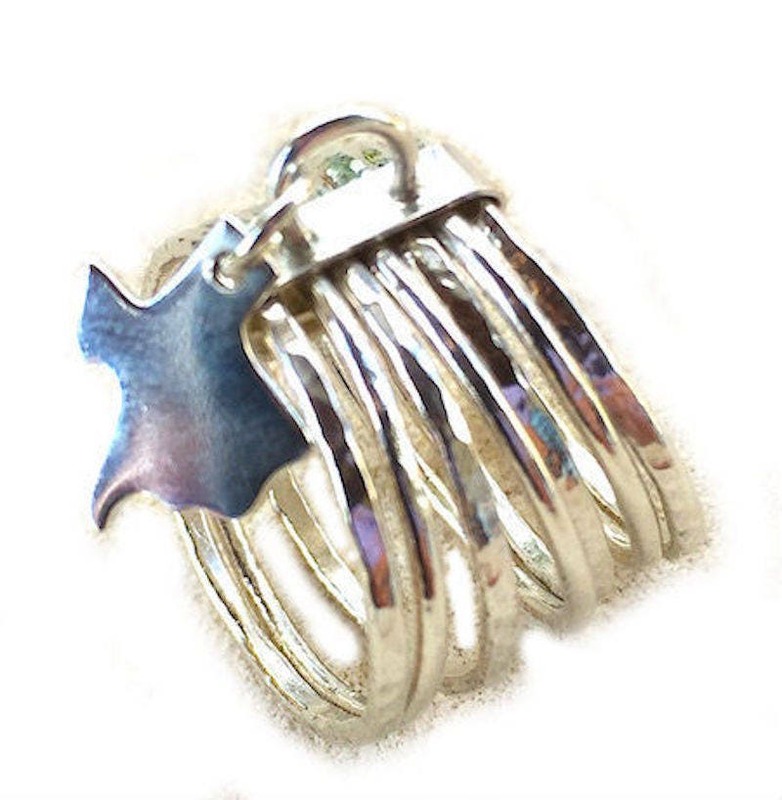 The wrap has a perfect sterling silver Texas charm attached and the resulting statement ring couldn't be more perfect. This has been a huge hit at local boutiques in the Texas Hill Country. You get to order it custom made straight from the designer! After measuring, cutting, soldering and styling the wire, I tumble the 7 rings in order to harden the delicate silver. Once the rings are secured with the band I tumble it again for a final gorgeous polish. This MADE TO ORDER ring takes time to create, as 16 gauge wire can be delicate when soldering. I will ship no later than 8 DAYS after your purchase, and always do my best to ship sooner. **I STRONGLY RECOMMEND you order a half size larger than you normally wear on your chosen finger, as this ring is approximately 10mm wide. Wider rings tend to need to be a little larger for your finger to be comfortable. Comes in sizes 5-12, including half sizes. I love my Texas ring!! !